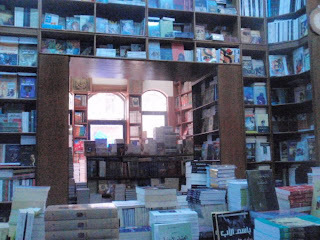 It was during our first trip to Amman for CRP three years ago that we originally listened to Iraqi refugees voice their desire to establish a lending library available to the refugee community. As non-residents, they have no access to public libraries and little money to purchase their own books. They told us that reading provides that intangible sense of a greater world being open to them. Free access to a library gives a sense of dignity, so damaged by their circumstances, along with feeling a part of a community and as a means to enhance their children's lives and education. We have held this dream for 3 years. On July 15th CRP opened the doors to that dream. On our opening night, 15 books were checked out! We purchase Arabic language books from a bookseller in Amman who has a wide variety of books for all ages and of all genres at very reasonable costs. Iraqi volunteers catalog the books according to genre and color-code them on the our shelves. To enhance our library project we're excited to initiate our first book discussion group. They'll start with "When Wolves Grow Old" by Jordanian author Jamal Naji. The book was on the short list for the International Prize for Arabic Fiction, which is part of the prestigious Booker Prize. After the group reads and discusses the book, they'll start another, passing the first book to a new group. In this way, our library grows as well as community connections for the participants. Our shelves are modestly stocked for now but we have faith that, with the good will of our supporters, they will fill. Just $100 a month will pay for ten books for the discussion group and a stipend for our librarian who will lead the discussion and supervise the library. If you are part of a book club or book discussion group, it would be a wonderful gift if your group could pitch in a small amount each month toward Iraqi refugees' literary discourse. If your group does this, CRP could share photos and messages between the groups for an even broader community of literature lovers and another step toward peace. Would you like to join our "book club"? Email us at crp.info@gmail.com if you'd like to do this.